In February 1806, the French drove the Bourbon king of Naples, Ferdinand IV, and his queen, Caroline (sister of Marie Antoinette) from southern Italy once again. The royal couple fled to Sicily, where they were protected by the British navy, and Napoleon made his elder brother, Joseph, King of Naples. The British were disappointed by the failures of Russia and Austria the year before. Napoleon might have been able to negotiate a settlement with Britain, but talks with the British in February and March went nowhere. In July, Napoleon put fifteen of the small German states into a "Confederation of the Rhine," its capital to be Frankfurt. Napoleon named himself the confederation's protector. The Holy Roman Empire was now abolished. In August, Francis of Austria renounced his title of Holy Roman Emperor, becoming merely "Emperor of Austria." There was the question whether Napoleon's new hold in Germany could be sustained with a popular base. But popularity outside of France did not concern Napoleon much. Hearts and minds was more of a concern for a few others. Military might was his focus. His taking what wealth he could from occupied territories had not made his rule popular in the Netherlands or in Italy. His added power in Germany annoyed the Prussians. Prussians were proud of the military might that had been created by Frederick the Great, and the new King of Prussia, Frederick William III, with his 200,000-man army, was unafraid and sent Napoleon an ultimatum, demanding the withdrawal of all French troops from east of the Rhine. In October, Napoleon instead sent his army of 122,000 against Prussia's army combined with an army of its ally, Saxony, a total of 114,000 men. The Battle of Jena-Auerstedt ensued. Napoleon was victorious again. His troops entered Berlin. Prussia's royal family fled beyond Danzig to East Prussia and fell on the mercy of Russia's tsar, Alexander I. Frederick William III united what was left of his troops with the Russians, and with Alexander he swore eternal brotherhood. Napoleon met the combined Prussian and Russian force in the cold of February 1807, at Eylau (today Bagrationovsk), where 45,000 more men died. The two sides continued their war, the port city of Danzig surrendering to the French in May. In June, the French and Russians fought about 100 miles (160 kilometers) east of Danzig, at Friedland (today Pravdinsk), with Alexander annoyed over Britain having failed to start a second front in Italy or in Holland to distract the French. The French won at Friedland and occupied Konigsberg (today Kaliningrad). Tsar Alexander, still annoyed with the British, met with Napoleon on June 25 in full view of their troops. Alexander delighted Napoleon by telling him (it is reported) that he hated the English as much as Napoleon did. Napoleon took a liking to Alexander. In July, Alexander, Frederick William III and Napoleon signed the Treaty of Tilsit. Frederick William III lost almost half his territory, including Danzig. He agreed to close his ports to trade with Britain. A French force was to be stationed in Prussia, where they were to be disliked, as foreign troops usually are. In the Treaty of Tilsit, Alexander recognized Napoleon's augmented Confederation of the Rhine. He agreed to leave most of Europe to France in exchange for a free hand against Finland, Sweden and the Ottoman Empire. 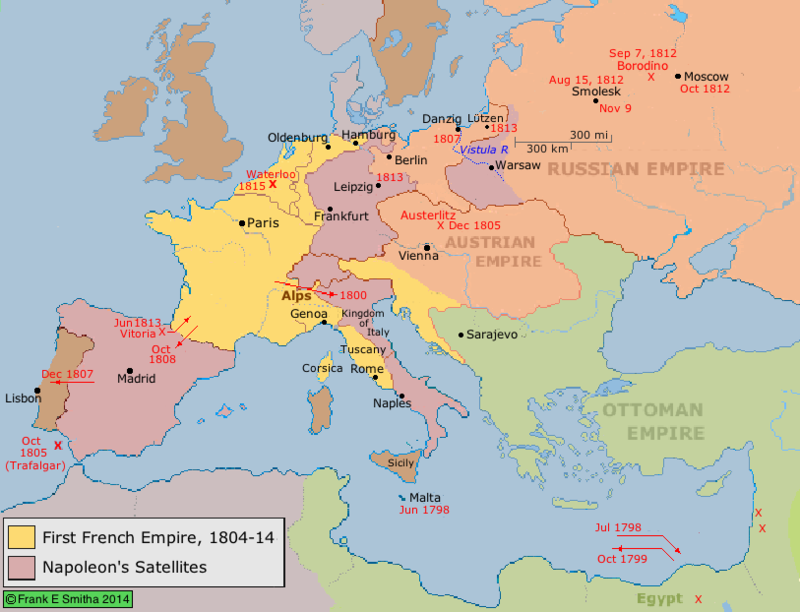 Napoleon created the Grand Duchy of Warsaw from that part of Poland that had been ruled by Prussia. Alexander agreed to join in the boycott against British trade, and he agreed that if Denmark, Sweden or Portugal left their ports open to British shipping he would join France against them. Napoleon demanded that Portugal join the trade boycott against the British. Portugal hesitated, because war with that great naval power meant cutting itself off from trade with its colonies. Spain allowed French troops to pass through its territory to apply control on Portugal, and the French captured Lisbon on December 1, as Portugal's royal family was fleeing to Brazil. Afraid of Napoleon, Denmark allied itself with Napoleon. The British feared the addition of Denmark's navy to Napoleon's side and it bombarded Copenhagen, captured the Danish fleet and took 22 Danish ships to England. Napoleon responded by calling the British treacherous and unscrupulous.